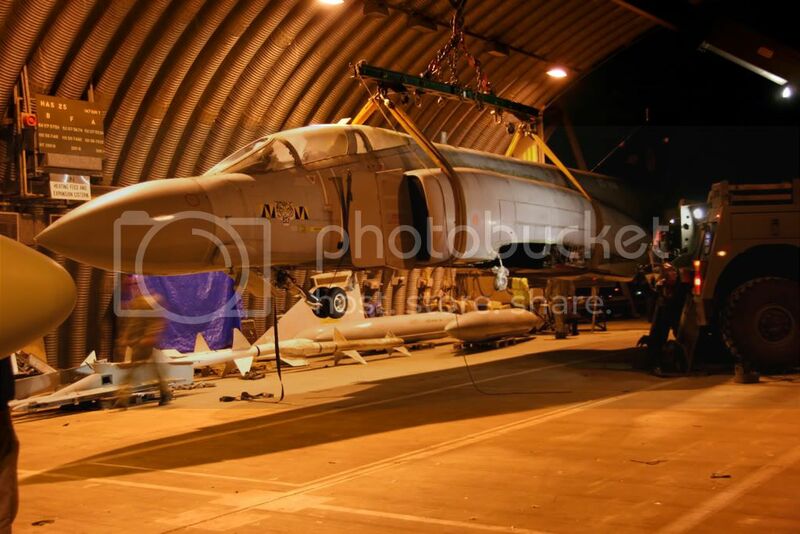 Went to Wattisham this evening to see a Phantom arrive for the first time in 20 years. Jokingly asked the squaddies to let us in and a gentleman in civies just tells them "they are with me" and in we go. Turns out he is a LtCol and Senior Staff Officer on base. What a gent. 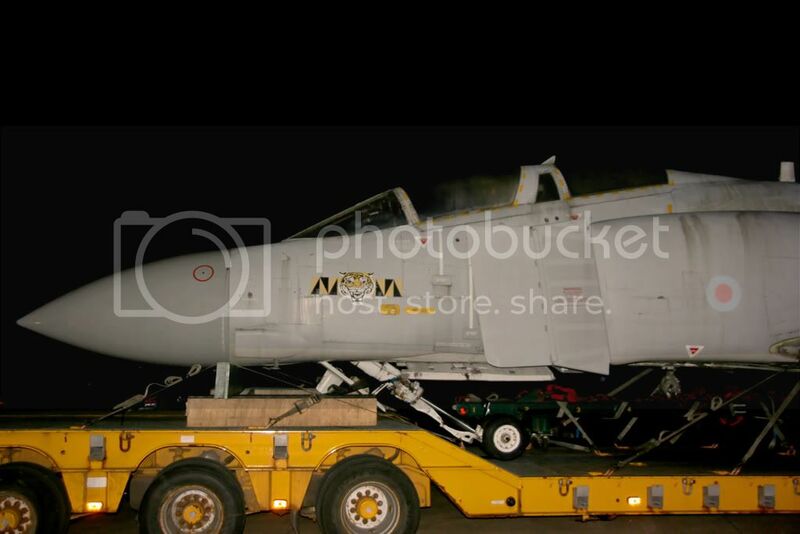 He escorts us to HAS 25 which is the museum to watch the Phantom be unloaded. 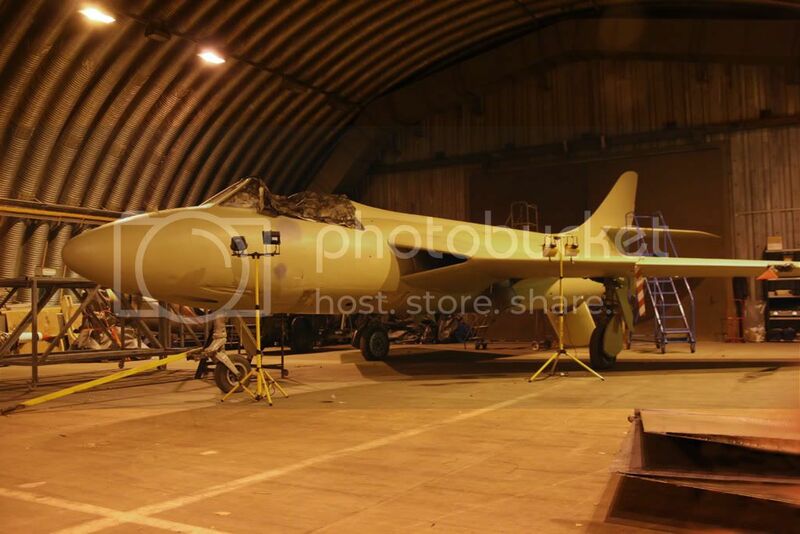 The Black Arrows Hunter in primer, awaiting its final coat. Thanks to all at Wattisham they were absolutely brilliant. Last edited by RoverDriver on Sun 08 Jul 2012, 5:14 pm, edited 1 time in total. Thats a great set of images of a unique moment in this aircraft's history, excellent! Last edited by FTS on Fri 16 Mar 2012, 12:36 pm, edited 1 time in total. I hope she doesn't mind being in a 56 Sqn HAS! I am sure she would rather be in. 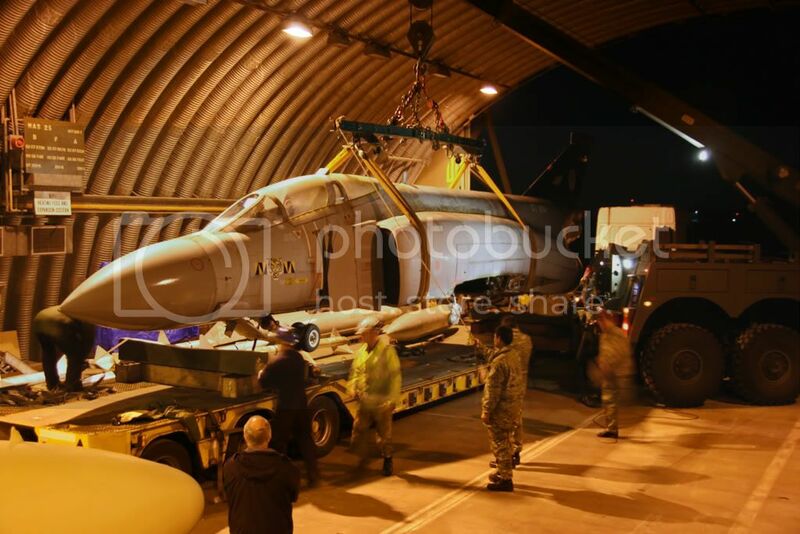 56 SQN HAS than under the scrap man's torch! I am just glad she is back home. 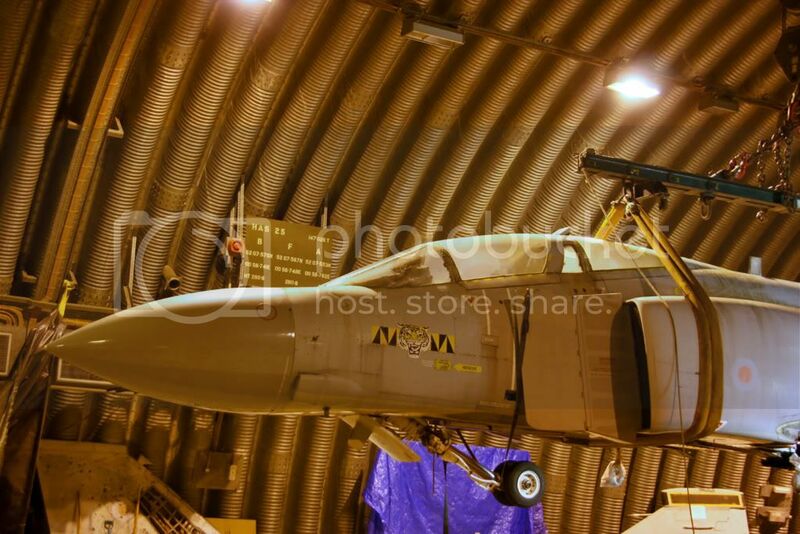 Brought back a lot of happy memories being back at Wattisham with a Phantom back in the barn. Got quite emotional with nostalgia. Nice one Tim, just shows a cheeky request does sometimes work! f-4 wrote: I hope she doesn't mind being in a 56 Sqn HAS! I am new to your site...................I live in the state of Michigan in the United States...................67 years old and a Vietnam veteran and since the Phantoms began to fly close air support for us when I was in Vietnam they have become my favorite fighter. There was nothing like the site of a Phantom coming in at tree top level spitting Zunis out the front and napalm out the back. It was quite a site! 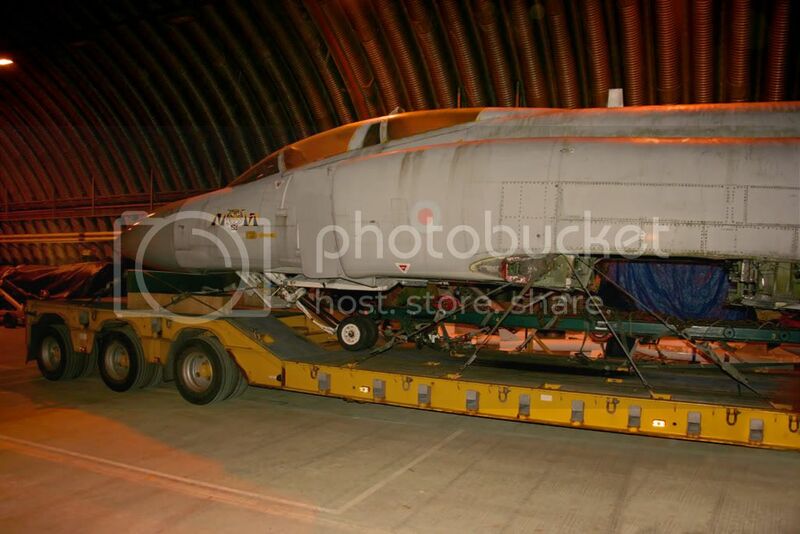 Glad to see they are preserving another Phantom there in the UK. What kind of history can you give me on this aircraft? Hopefully someone can post reassembly pics?? edpop1944 wrote: What kind of history can you give me on this aircraft? If I remember correctly it is a twin stick version (the RAF had a few). 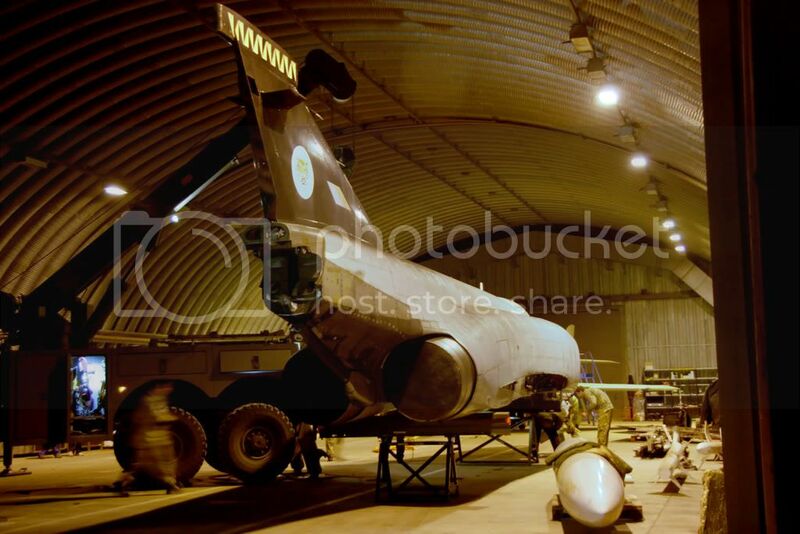 I think in it's final years it was with 64 Reserve squadron (Operational Conversion Unit) at Coningsby. 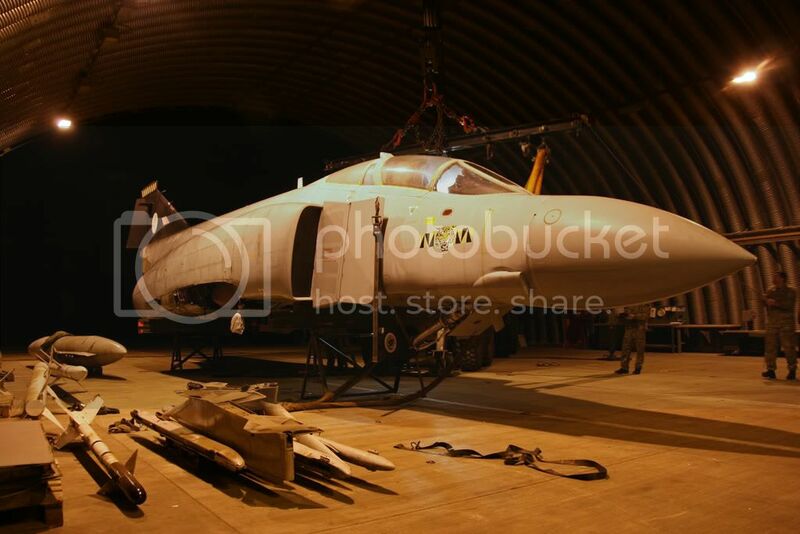 When the Phantom OCU closed the aircraft (along with other FGR2s) were transferred to 74 Squadron (circa 1991). 74 Squadron were flying ex-US Navy F-4Js, at the time. The F-4Js, were equipped with different engines (J-79s) and it made them unique amongst the RAF Phantoms. It was decided that these ex-OCU aircraft would go to 74Sqn to bring the whole Phantom fleet in line. Around this time 19, & 92 sqns at Wildenrath, 56 Squadron at Wattisham and the Falkland Islands 1435 flight, were also still using the FGR2. XT914 was selected as one of two specially marked Air display Phantoms to take part in the final year of flying in 1992. 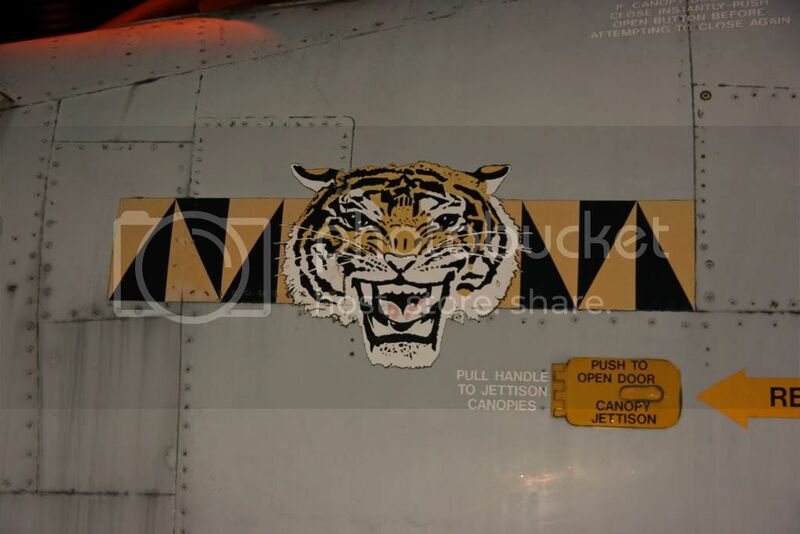 These were painted up with dual markings of the final two squadrons, 56 & 74. 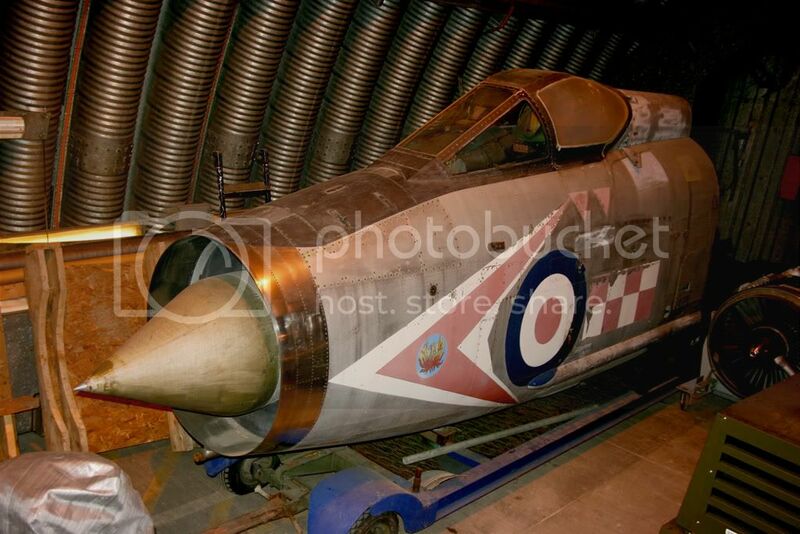 The 56 sqn Firebird was painted on the nose and red white checkerboard applied alongside the roundel. 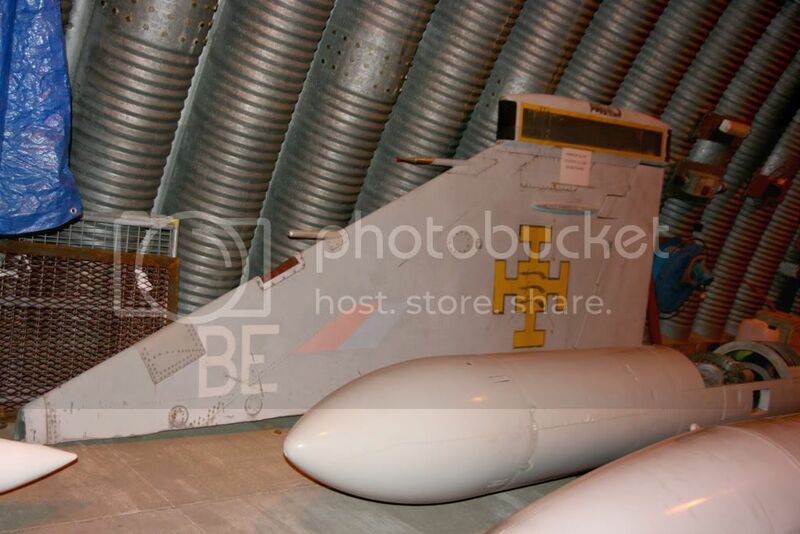 Following retirement I think it initially ended up at Leeming before being repainted and put on display in more standard 74sqn markings at Brampton. If the security implications are as you suggest, I would have thought that the mere fact that a very senior officer sanctioned the admission is the crucial point, whether or not the pictures were published. So, perhaps the implications are not as serious as suggested. DanO1978 wrote: Just out of interest, did you have permission to post these images online, fascinating though they are? Given Wattisham's Royal connections these days, I'd imagine the Household security, not to mention the tabloid press, would be rather unimpressed that members of the public were getting access to the base in the manner you've described. Kind though the base personnel were, you've rather hung them out to dry by posting these images, unless you were specifically told you could. You never know who reads UKAR. Just a thought worth remembering. That's the exact reason why none of the pictures I took of XT914 being taken apart at Brampton are on the web. That's the Station Photographer and the Media Sections train set. Anything outside the wire is fair game and i've posted them on here. I'm concerned that senior officer or not, he just walked you onto the base! Were you booked on through the guardroom at all? I would have thought that the recent incident at Odiham would have taught some lessons about civilians asking for access to camps to take pictures! I had full permission to photograph anything in the museum by a senior officer. I agreed not to photograph anything of the base facilities. There is nothing in the photos of any value to any potential aggressor. No service personnel who can be ID'ed from the pics. I was escorted throughout my visit. There were armed guards on the gate and I am known to the local base security. 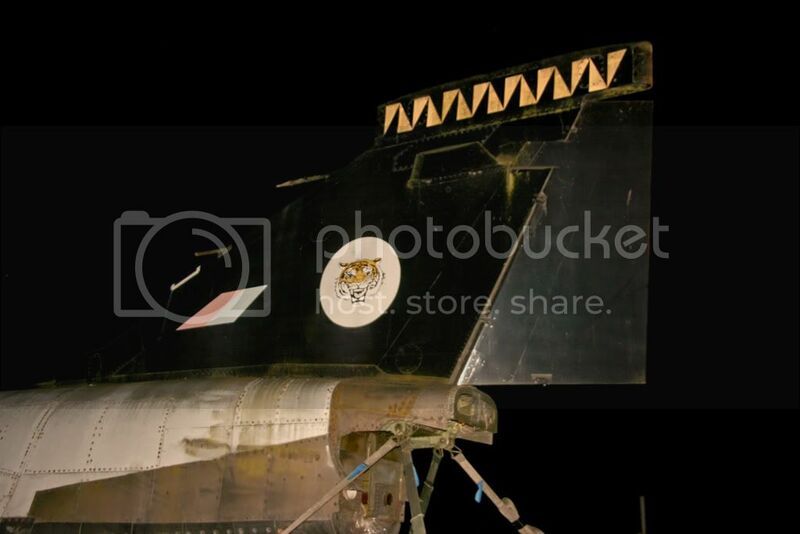 Pictures by another photographer were published by the base museum in the local press. Rest assured there has been no breach of national security. If you read my posts from this week you will see that I take national security very seriously, even reporting suspicious characters to Wattisham security.